Happy Monday!! I posted this outfit on my Instagram and got tons of questions about my shoes and dress, so above are all the details!! 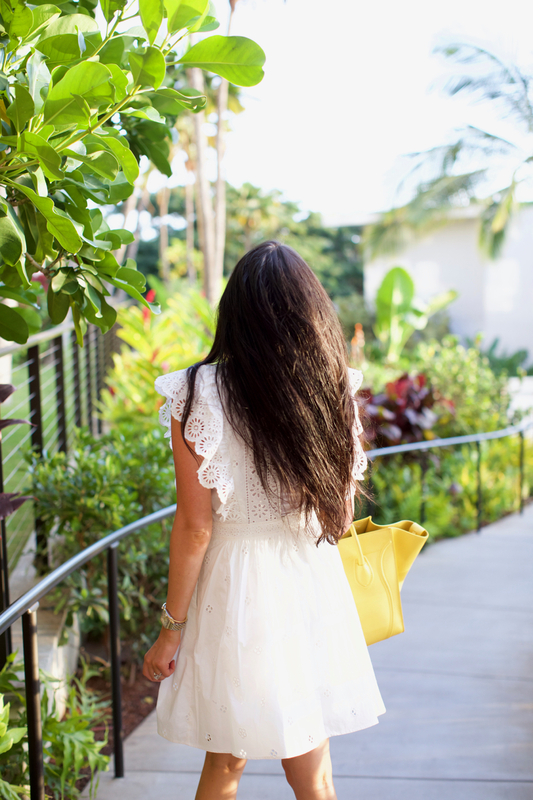 I’ve been so excited to wear this dress because I’m SO obsessed with the eyelet and ruffle details (I linked up some similar dresses that I love too!!). I always get so many questions about where we like to stay when vacationing in Maui, and earlier this week we made it to the gorgeous Andaz Maui Resort on Wailea island! We’ve stayed here multiple times (the first time was our baby moon when I was pregnant with Isla) and continue to love it! They have to most incredible views of the ocean, the pools (there’s 5) are amazing and the food is sooooo good (if you go, get the lobster grilled cheese and waffle fries). I’m sad our trip is over but it feels good to be back home! Isla was so excited to see her Dasher boy! I hope you all had a great weekend!! Thanks for stopping by! That dress is so cute!! Perfect little vacation dress! You look absolutely beautiful but I’m sorry to say that those shoes are seriously stealing the limelight! They are so gorgeous!! Oh how beautiful, girly and summery you look in this outfit! I like your dress and bag so much! Thank you for following along, Soraya! Looked like a beautiful trip! Are you still going to reveal Jackson’s nursery? Thank you! Yes, we just haven’t quite finished it yet with everything being so busy! I have those Marc Fisher espadrilles too and they really are the BEST! love your entire look! They really are the best! Glad you have them too, now we just need summer! Love the sleeves on that dress, so cute! your vacation looked so dreamy!! Those wedges are amazing! I love the color. I also love that eyelet dress! That dress and shoe combo is amazing! This white dress is adorable! I love the flutter sleeves and eyelet details. I love this look so so much! You look amazing Rach! I want to be in Hawaii!!!!! orangeblossomology.com || insta: rubydraayer ?? You are so sweet!! Thank you for following along! Such a cute sundress! I am dying to go back to Hawaii- haven’t been in years! I lovee that dress and those shoes!! Such a fun beachy vacation look! Thank you for following along, Audrey! You are so nice! Cute Dress, lovely shoes, and great bag! Love this entire look! I absolutely LOVE your dress, it’s so cute and looks great with those shoes and bag! Thanks for the suggestions on where to stay in Maui, too! Love this look and the color of those wedges! Thanks for sharing so much of your vacation in Hawaii. Love that island so much! Love the sandals with this dress! Vacation sounded so fun. So sweet that Isla excited to see Dasher. I’m sure he felt the same! That white dress is gorgeous! I always love a great white dress! Maui looks beautiful, we usually go to Honolulu but would love to visit Maui. I recently featured those shoes as a must have for spring my blog http://finastyleblog.com/2017/01/spring-shoes/ Love them! I love to find blogger inspiration for tropical weather! Love your cute dress and the light blue shies with the yellow Céline! So perfect!